Maddock and Bones set off on their first treasure hunting adventure! 1715 - Blown far off course, their treasure-laden ship sinking, a crew of Spanish sailors struggles ashore, only to encounter a horror out of their worst nightmares. 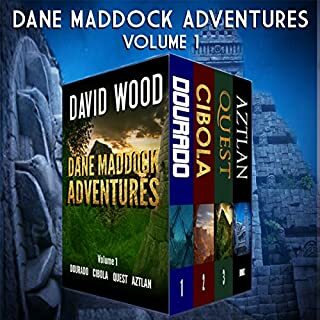 Dane Maddock and Bones Bonebrake have left the Navy SEALs and set out on a search for the legendary lost treasure fleet. The search takes them to Haiti, where they encounter the forces of a madman bent on finding the treasure in order to fund his maniacal experiments and help him seize the power he craves. But not all their foes are human. 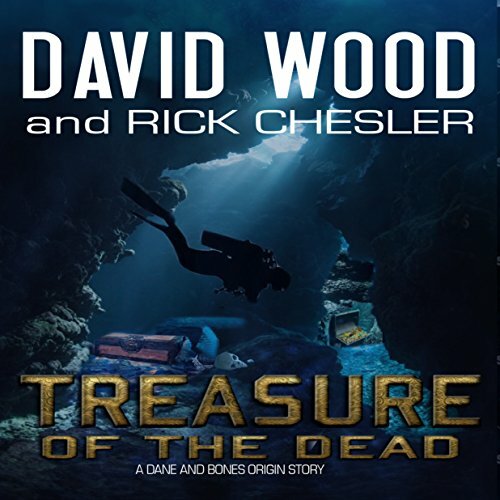 Mystery, history, and legend meet as Maddock and Bones scour ancient ruins, plumb the depths of the sea, and come face to face with pure evil in their quest for the Treasure of the Dead. Dane & Bones are at it again! David Wood teams up with Rick Chesler again. Two of my favorite authors writing short adventure fiction definitely peaks my interest. So much so that as soon as I finished the book I was reading after receiving this book, I just went right into this. Much similar to Wood & Chesler, Treasure of the Dead brings back Dane and Bones for another adventure. This time they are going out on what they think is a normal treasure hunt. But, can anything ever be normal for Dane and Bones? I absolutely love these sub-6-hour audiobooks for these stories. 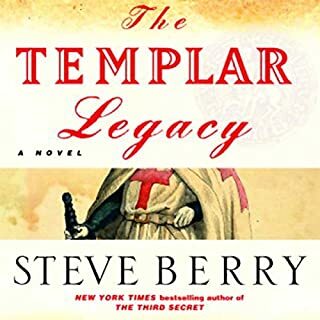 I know that some people don't like spending money on shorter books like this, but I got more enjoyment out of this 5-hour audiobook than I've gotten out of 13+ hour ones. 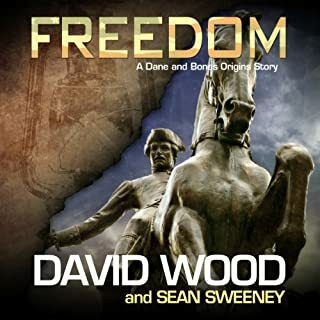 I haven't read all of Wood's original (longer) stories or all of the Dane and Bones novellas, but every one of them that I've read feels incredibly well researched and thought out. Every time I read it I feel like I have stepped into the shoes of the adventure team that is heading out with Dane & Bones and we are definitely going to have a story to tell once we make it home again. The narration was done by Jeffrey Kafer who absolutely crushes it like he has for all of the other Wood stories I've listened to. If you don't know Kafer's name and you're into audiobooks I'd be shocked. I received this book as a gift, and this has not affected my review in any way. If you enjoyed this review, please vote for it. If you'd like to see more like it, please check out BriansBookBlog DOT com. Dane Maddock has become one of my favorite book characters. The books (while fiction) have a dash of history, action, mystery, and likable characters. This book is no exception. One thing that I like about this series is that you don't really NEED to listen to the books in order. While there is a backstory and value in listening from the beginning, I have bounced around several times to different books with no issues. Jeffery Kafer narrates several of the book series I've listened to and I look forward to his performances, just like in this book. He's definitely a pro. Continuing the origins of Maddock and Bones partnership, this book is the first treasure hunt after leaving the seals. Good story that moves at a nice pace. Jeffrey Kaffer as usual does a good job bring the Dane and Bones world to life. I always enjoy getting to spend any hour with Maddock and Bones. Their banter always brings a smile to my face while their adventures make my heart race. I enjoy the twist to the history that's created, a twist with a slight paranormal feel to it, as we go on the expedition not knowing what we'll walk into yet knowing it's going to result in danger and action. This book is shorter in length, as audio it's just shy of 5 hours. The authors keep the story to the point of action, where we learn details of what we are looking for which leads eventually to troubles for our guys. We don't waste time getting from one point to the next as long as there is nothing extraordinary happening. When things start to come out in the end, it all happens fast. Maybe a bit to fast, but that's the way it washes out in the end - all at once. Jeffrey has voiced all the stories in this world with these men, and he is with us again. Jeffrey has become the voice of Maddock and Bones and all friends they interact with. The best part, I feel as the personality and tone given to Maddock and Bones fit the people written in words. For some reason Bones feels natural, but he's probably my favorite of the two. lol. Jeffrey never gives away a feel that something is coming, he adds just enough tension to the story by keeping in the here and now. This leaves me feeling comfortable with the characters but knowing with the writing of David and Rick that something is coming, I'm just waiting for it. *I was given this review copy audiobook at my request and have voluntarily left this review. In the beginning we see a glimpse of a different side of Maddock and Bones. They left SEAL just months ago, and both are struggling adjusting to civilian life. Bones seems to be worse in a different way than Maddock, needing a release for pent up frustration. I like seeing them struggle after their life has been SEAL for so long. The life they lived is completely different than how they are to live now. Maddock shows up to ask Bones to help on a treasure hunting expedition, something they know how to do but less dangerous for their lives. These two never lose their great humor that makes me smile even in the tough times. This is a slower start in the way of action for Maddock and Bones. But the authors strategically write in sections, as they are known for, with other characters. The events of the other characters then lead to our guys arriving, and things don't go as smoothly as it should, which could be to Bones and Maddock's liking. Well, maybe just Bones. They do enjoy their danger. We see Bones flirting, as usual but with someone that he has some past with. The friend that contacted Bones is/was more than a simple friend. She and Bones have history together. Great origins story for some great fictional characters. I love how the author threads in factual information into his stories. I have listened to multiple Dane and bones Doris's and loved them all. To finally see how they got started was a great treat. Highly recommend this story. I was voluntarily provided this free review copy audiobook by the author, narrator, or publisher. Just a bunch of retired special service guys out for a treasure hunt. Nothing like running into groups of Zombiis to Change those plans. It does have all the required story parts with good and evil, secret rooms, private islands with mad dictator wannabees. and sunken treasure ships. It is a entertaining read and well worth while. I always wondered how Dane and Bones got their start on the Sea Foam. Goin after treasure and getting on some crazy adventures in the process. I'm very happy to have this origin too fill in those gaps! 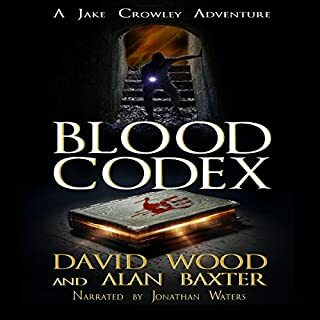 Wonderfully written as usual David Wood is one of my favorite author's and I really enjoyed Jeffrey's portrayal of the characters. What great dynamics! Thank you so much! I can't wait for the next adventure! Maddock and Bones are back together again! The two former Seals are looking for new adventure in book 9. They find it as treasure hunters. Their first search is for a shipwreck lost back in the early 1700’s. Was what it carried worth dying? Someone else is after the treasure, following the two, secretly at first, then not so secretly. It will lead Bones and Dane into dark dangers in Haiti. Zombies are included, but don’t let that stop you. They are not the usual un-dead sort, but rather something very sinister in their own way. The entire series is so much fun! Every book is an exciting, fast paced adventure that is a pleasure to read. You will grow attached to the Seals. I’m looking forward to more! How do these guys always find trouble? I have read or heard many of the books in the Maddock and Bones universe and liked them all. This book is no exception. It is a fast paced thrill ride in an exotic place with a historical mystery to solve. There are many odd characters and situations that drew me in and lead me to the end I one sitting. There is plenty of humor and action to hold the interest as well as fascinating history to boot. This is well worth the listener's time. 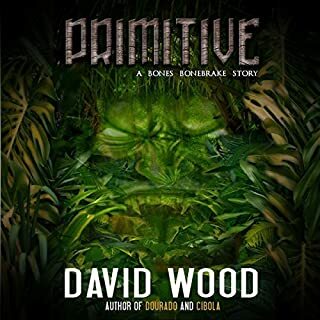 I hadn't heard a book by David Wood before, and I was a little concerned that it wasn't the first in a series, but I did really enjoy it. Now I'll have to look for others by him. I was given this free review copy audiobook at my request and have voluntarily left this review.